Customer Service eLearning & Onsite Training Customized Engaging Customer Service Training Your Job Isn’t to Keep the Store. Your Job is to Keep Customers. Your Job Isn’t to Keep the Store. Your Job is to Keep Customers. S&H Green Stamps, Muskogee, Oklahoma, a photo by Myra Golden on Flickr. Yesterday I was in Muskogee, Oklahoma for a football game that my daughter was cheering for. She had to be at the game an hour early. So, I dropped her off and drove to downtown Muskogee just to see if I could find something interesting to photograph while I waited for the game to start. It didn’t take me long to discover that something “interesting.” I found this S&H Green Stamps sign hanging over what used to be a grocery store. 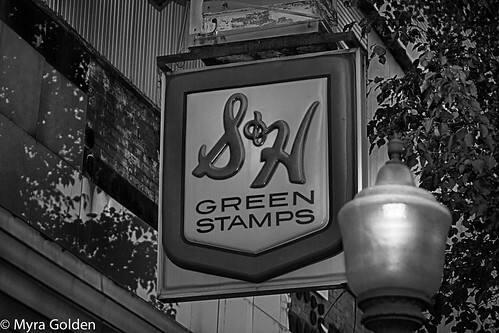 I immediately thought of my mother when I saw the S & H Green Stamps sign. When I was a little girl, I remember my mom specifically chose to shop at retailers that offered Green Stamps, and she loved redeeming the stamps for gifts. S&H (Sperry & Hutchinson) introduced the world to customer loyalty programs back in the 1930s with Green Stamps. We need to get back to a true focus on customer loyalty. Customer loyalty can’t be a push of the month, a buzz phrase, or just fluff. The essence of business actually needs to be about keeping customers. S & H Green Stamps was created to help retailers keep customers. The program worked because business owners understood the importance and critical need of keeping customers. Does your business truly “get” customer loyalty? Seriously, does your business get it?